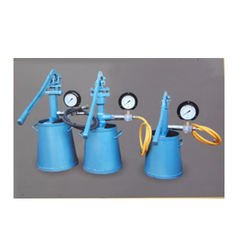 Manufacturer & Exporter of Hydraulic Test Pump. Our product range also comprises of Dosing Pump, Victaulic Couplings and Water Treatment Plant. Our organization has gained immense recognition for offering quality assured Hydraulic Test Pump. These pumps are made in line with international standards using quality tested basic material that are procured from reliable vendors of the market. We offer these pumps are in numerous specifications and can also be customized in order to fulfill the diversified requirements of the clients. Our renowned clients can avail these pumps at most reasonable prices. Our organization has gained immense recognition for offering quality assured Hydraulic Test Pumps. These pumps are made in line with international standards using quality tested basic material that is procured from reliable vendors of the market. We offer these pumps are in numerous specifications and can also be customized in order to fulfill the diversified requirements of the clients. Our renowned clients can avail these pumps at most reasonable prices.